I’m throwing in some more random QuiltCon pics while I wax philosophically below. 🙂 Click here to see most of the quilts from the show, courtesy of Sew Mama Sew. It’s no secret that in the last few years my quiltmaking style has definitely changed. I’ve enjoyed making quilts for 20 years now, but only discovered the modern quilting style back in 2012 when I first heard about the movement in a traditional quilting magazine. I was instantly stopped in my tracks when I realized this is what I had been searching for, but didn’t know it! 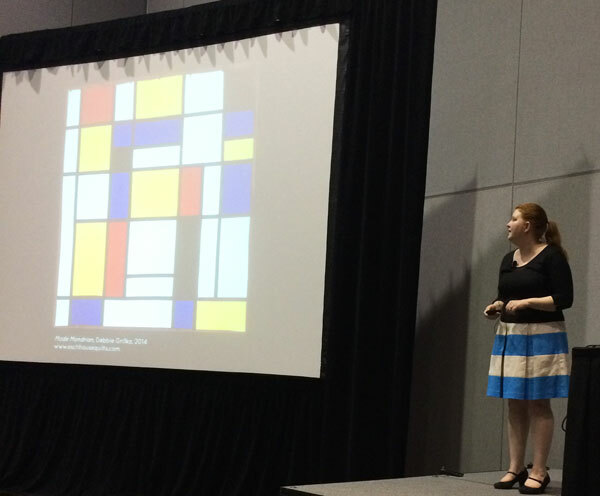 I loved Casey York’s lecture on finding modern inspiration in art! Quilt by Debbie Grifka. I also love it that people are so passionate about their opinions! I’m not one to stir up debate, but I love reading the emphatic appeals from quiltmakers on one hand who don’t want to be labeled and those on the other hand that do! Isn’t it so awesome that within the larger quilting community, there’s room for all styles and tastes? 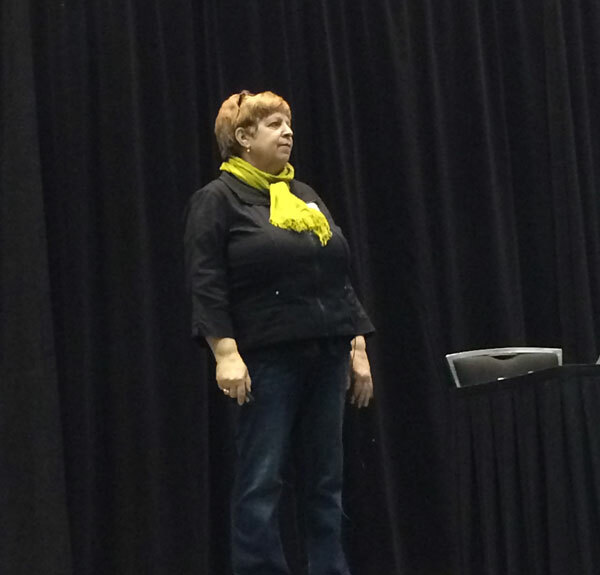 I picked up some great tips from Jacquie Gering on being a better teacher. We also had some great conversation about modern quilts and what a wonderfully unique show QuiltCon is! Going to QuiltCon in 2013 put me on a career path that inspired me to publish patterns, write a book and return to teaching quilting after a long absence. 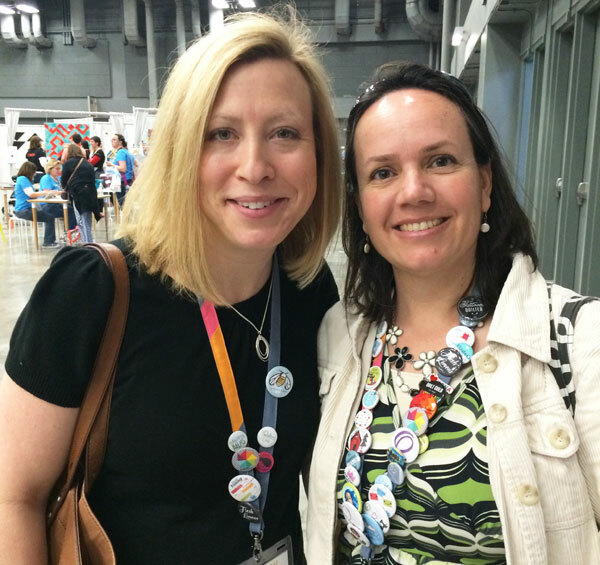 Attending QuiltCon again in 2015 solidified my desire to want to make and share even more! Lee Heinrich and I stealing a few moments to chat on the show floor. 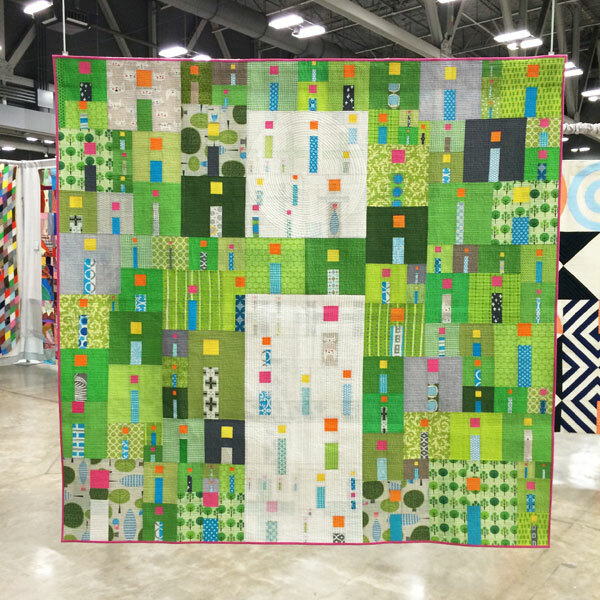 Be sure to read Lee’s QuiltCon comments here. I think she’s right on the money! Getting some great tips from Cristy Fincher from Purple Daisies about submitting a class proposal to Craftsy. She’ll be launching her first class soon – stay tuned for details! But far be it from me to ever demand any of my friends or fans to follow in my footsteps. Instead, I’ll continue to explore the modern aesthetic and will seek to educate myself (and others) about it whenever I get the chance. Because what I love most about the quilting community are the many friendships I’ve made while pursing this passion. 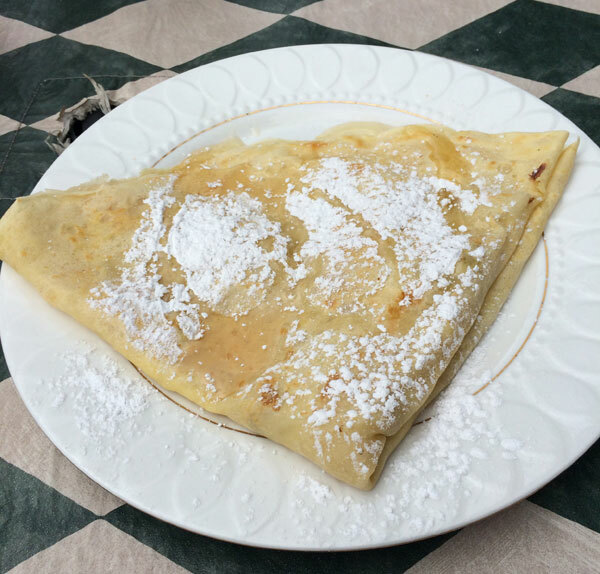 Delicious crepes for brunch with fellow bloggers. The food and conversation were delicious! Visit Elizabeth’s blog at OP Quilt to see a much better picture of the group than the one I had! 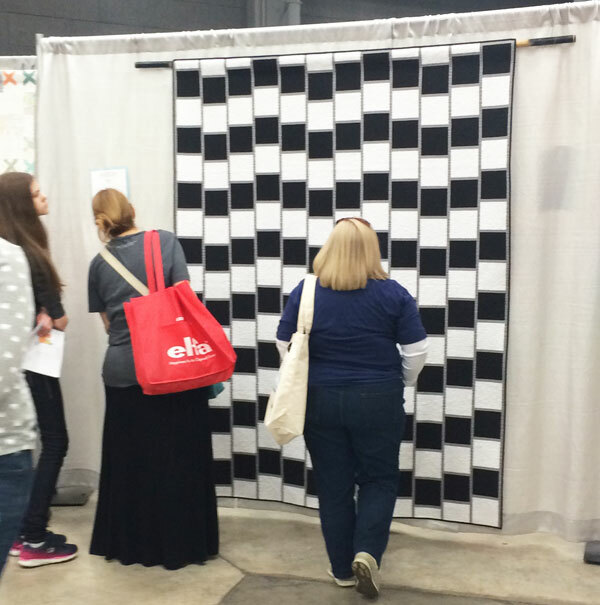 I loved the quilts of QuiltCon because you could really see the heart and soul that went into each of them. I enjoyed viewing so may original compositions and appreciate that there was such an emphasis on aesthetics and design. I’ve also been exploring how to incorporate many of the principles of modernism (negative space, minimalism, asymmetry, clean lines, abstract design and even improvisation) into my machine quilting and it’s been a fun ride! Yes, I totally admit to stalking my quilts! It was so exciting to see people admire my work! Best of show – i Quilt by Kathy York. When I saw it in person, I didn’t see the larger “I” at first. Then I realized it has so much meaning in the message! Now, who wants to go make a quilt? 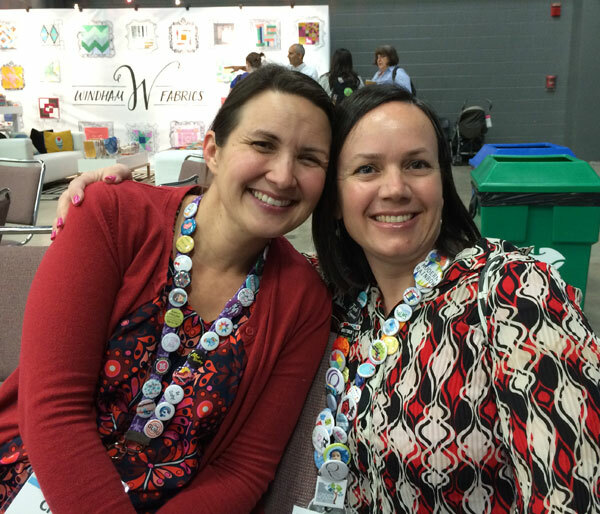 Let’s Have a Giveaway – Courtesy of QuiltCon! I completely agree, there is room for all types of quilts and quilters. Modern quilts certainly sparked a new fire in me and got me sewing quilts again after taking a thirty year hiatus (children).I also go to modern art museums with more enthusiasm than usual, to get ideas, inspirations. Enjoy reading your blog. Enjoy modern quilts, but continue making mostly traditional quilts. Modern quilts do inspire me, but so do vintage and antique quilts. Quilting is about more than the particular quilt style one creates. Friendship, creativity, sharing with/teaching others are important for me. Appreciate your viewpoint. It’s such a shame that those who would so vehemently condemn this movement of today would actually be exhibiting the intolerance they think they’re attacking!!!! The quilting community is as diverse as its members!!!!! Now, let’s go stitch!!!!!!! Christa, this is exactly why I love following you! You are so open minded and just want to share your enthusiasm for quilting. I don’t label myself anything but a quilter. I like what I like (modern/tradition) and I’m okay with it. I love your post(s) and look forward to watching what you do. I am a new quilter so I’m trying out many things I see — traditional and modern. I don’t think I want to categorize myself as either just yet, but I certainly have fallen for the modern quilts I’ve seen. Thanks for posting pics from Quilt Con for those of us who weren’t able to get there. I would love to try your Optical Illusion quilt if you sell the pattern. Yes, yes! I joined the MQG as a member at large because of your enthusiasm Christa! I love all these posts and I love that iQuilt. I hope to be able to work up a design or two in the modern style some day! Thanks for all you do! I’m relieved to hear you admit it; I did’t see the larger i at first either. I think I was too close to get the full picture. Catching this aspect certainly adds clarity to the overarching design. You’ve made some excellent points about modern quilting. I remember going to a group years ago and coming home feeling so relieved because I found somewhere I belonged It was not quilt related but I will never forget that feeling of acceptance. It was not an easy road for a long time but eventually all worked out good. I hear this in your post Christa so Go For It!! Appreciate this post, especially the overall acceptance while still following your passion. AND your statement in bold. btw, sorry we didn’t meet while we were there! True, True and True. It’s interesting because I read this post after reading the latest one from Jacquie…and they so fell in line with one another. You are correct. love what you do, love what you make and if modern quilts aren’t your thing…that’s fine. knowing ~ Thank you for another inside look!! It’s so wonderful to read a blog post that invites everyone to the world of quilt, no matter their taste or aesthetic. So many bloggers choose a “side” and push everyone to their side of the fence. I say, no fences so we can move around, visit, and have fun! It okay to put a name to types and tastes, but crawling into a labeled box and staying put is not an option some of us want. What a great post! I Don’t care what my quilts are called, modern traditional whatever, as long as I enjoy making them & someone enjoys using them! I mean that in the nicest possible way, not wanting to upset anyone at all. At the moment I can’t get enough of EPP , but I’m also making some ‘traditional ‘ blocks that I havn’t made in years. I would love the opportunity to attend a show in America, maybe some day. Thanks Christa. Excellent explanation! I hear love and freedom and a warm invitation in your words! Thank you!